Here is a brief introduction to a practical course I designed and led for the Stonehenge volunteers in September 2018. Photos and discussion of the work in progress can be found in the Research page of this site. This course aims to take volunteers with no previous experience through the methods and techniques of Neolithic Carpentry and Timber Construction. The course looks in detail at the process of taking a whole tree, reducing it to usable timbers, and using those timbers to create carpentry projects. The carpentry project should be recorded for statistical data and construction detail – providing good educational and interpretation opportunities. For this workshop, the carpentry project focus will be the design and production of a timber cradle to house the monolith. A starter set of stone tools is provided. These tools will become the basic tool set for any future projects and will need to be maintained and improved when necessary. The course will comprise of 4 elements…. Timber: Understanding tree species and their specific uses. 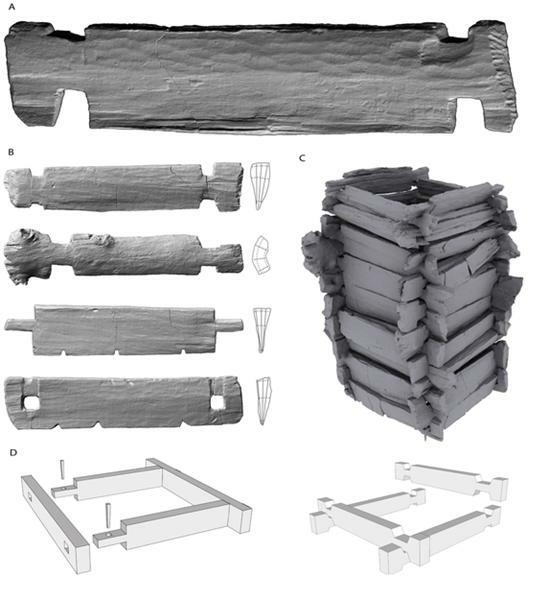 Looking at original evidence for Neolithic timber working and carpentry – what does it tell us about the Neolithic world? Looking at the theory of harvesting and seasonality. Design and project planning. 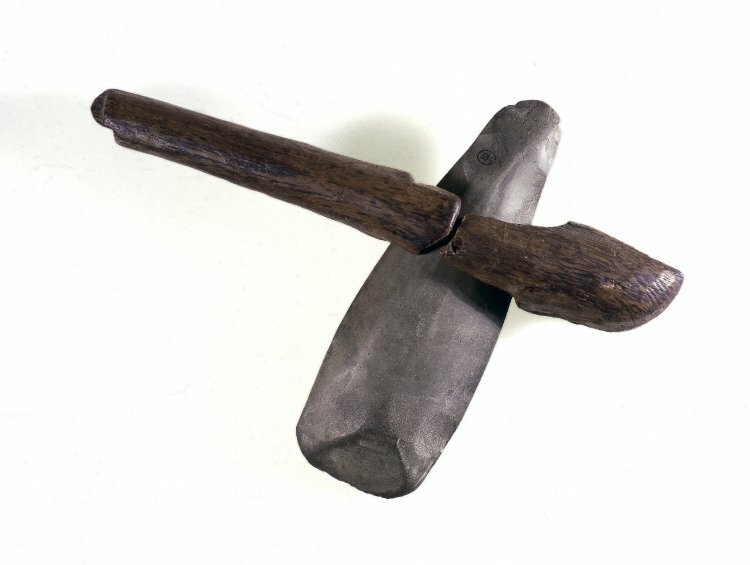 Tools: Understanding Neolithic tools. Bone vs Stone – what we don’t find. Looking at the maintenance and improvement of tools. Sharpening and honing, angles of attack and principles of use. Production of mauls and wedges, breaks and horses. Principles and methods for recording work and technical detail. Producing Usable Timber from Trees (PRACTICAL SESSION): Practical session that reduces a log into flat and long timbers. Cleaving, adzing and cross cutting with wedges, mauls and axes. Neolithic Carpentry (PRACTICAL SESSION): The use of bone chisels and stone axes to create mortise and tenon joints, pegs, notches and holes, mortises with fire. Making timbers meet and frame building. Surface finishing with scrapers, sand and leather. Tree Species and their Uses. Apple/Pear. A stable and sound timber that lends itself to jobs such as Mallets, Clubs, Printing Blocks, and the Teeth of Gears. Blackthorn. Dense and hard, traditionally used for Cudgels and Whip Stocks. Bog Myrtle. Used for wax production (boiling the shoots and skimming the waxy scum). Box. Sold by weight rather than volume, this dense hardwood has always been prized for detailed carving. Pulley Blocks, Mallet Heads, Rulers, Shuttles and Spindles, Combs, Woodcut Blocks. Cherry. Turning, Perforated Work, Pipe Stems, Instruments. Dogwood. Flexible when green, stiff when seasoned, used for Ramrods, Arrows, Skewers and Goads. Elder. The main stem is dense and hard, used as an Ebony Substitute, or Box. The branches are hollow when the pith is removed and used for Pipes, Whistles, Blow Pipes. The pith was used for Wound Packing, and Cleaning of delicate items. Heather. Roots were used as pegs or nails for hanging slates, Thatching, Packing, Pot Scrubbers. Holly. Dense and white – used for Butter Pats, Handles, Engravers Blocks, Net Makers Needles, Whip Stocks. Hornbeam. Shoots used for Hoops, Engineering Wood before iron was in common use, Cogs, Pulleys and Screws, Shoe Lasts, Piano Keys, Mallets, Plane Stocks. Horse Chestnut. Milk Buckets – resists rot in permanently wet, Bobbins, Cutting Boards, Fruit Racks. Lime. A fine Carving Wood, Hat Blocks, Cutting Blocks for leather work, Boxes, Inner bark – Rope, Outer Bark – Roof Tiles. Poplar. Chest Building, Neolithic Doors, Base of Carts and Boxes – resists wear and splintering, Brake Blocks on carriage wheels, Floors of Drying Houses (resists fire), Bark for tanning. Spindle. Used for Spindles, Skewers, Knitting Needles, Pegs, Toothpicks. Walnut. Maintains its shape, does not warp and takes shock. Gun Stocks, Tool Handles. Whitebeam. Knife handles, Cogs, Tool Handles, Spoons, Cues. Scots Pine. Building, Box Making, Herring barrels, Oars, Masts, Spars, Shingles, Road Surface (end grain up), Sleepers, Shoes, Pine Splits (dried and thin, burn like rush lights), Pinewood Ropes (boiled and mashed to get fibres), Baskets, Waterpipes (12@ long with 3” diameter bore). Yew. Claimed to outlast Iron as Fence Posts, Knife Handles, Withies (boiled), Barrel Hoops, Baskets, Fire Beaters. Larch. Staves, Pails, Churns, Boat Building, Bark for Tanning, Pit Props, Piling, Fencing Stakes and Gates. Spruce. Shingles, Staves, Hoops, Sieve Frames, Boxes, Baskets, Pails, Instruments, Bark for Tanning. Alder. Charcoal, Clogs, Hat Blocks, Broom Heads, Bark – Tanning . Ash. Easily cleft and bent, light, strong, able to withstand stress and sudden shock. Not good in the ground but prized for most other jobs. Cart Frames, Wheelbarrows, Trays and Troughs, Wheel Making, Spokes, Shafts and Rims, ladders, Handles, Oars, Paddles, Rudders, Bats, Sled Runners, Arrows, Spear Shafts,.Hoops, Turning. Beech. Works in any direction, cleaves when seasoned but with little natural durability, Chair Lags, Tent Pegs, Shoe Lasts, Brush Backs (can take many bored holes), Chopping Blocks, Tool Handles, Bands and Hoops (seasoned and steamed). Birch. Traditional northern uses include Rafters, Furniture, Barrels, Doors, Spoons, Carts, Ploughs, Gates, Fences, Rope, Small Branches used for Smoking meat and fish, Bark – Tanning, Bark – Rope and Candles, Bark – Tiles and Containers, Bark – Birch Tar, Spray used for Thatching and Besoms. Well seasoned – its qualities resemble Oak – although it does not last in the ground.and is generally used indoors. Sweet Chestnut. Strong and durable but prone to shakes, preferred to Oak as a timber in the ground, Fence Posts, Pit Props, Hurdles, Barrels, Ladders, Staves, Rope, Shingles, Hoops, Charcoal. Elm. Good durability if kept wet, not good in the ground, Water Wheels, Water Gates, Piling, Outdoor Furniture, Resistant to splitting lends itself to Cow Shed Partitions, Boxes, Wheel Hubs (will not split with spoke holes), Solid Wheels, Chocks and Wedges, Boats (below the waterline), Pulley Blocks and Wheels, Chopping Blocks, Dough troughs, Cheese Moulds, Bellows, Hammers, Mallets, Water Pipes, Capstans. Hazel. A fantastic timber with pliable shoots. Coppiced on multi year rotations to produce timber of varying size for various tasks. Closely managed to provide hurdles and fencing into antiquity. A 7 year rotation was encouraged by statute in 1483 and coups (from the french couper – meaning “cut”) were carefully controlled and fenced to discourage grazing and browsing by animals. Hurdles, Spars, Rods, Hoops, Crates, Wattle, Rope. Oak. Wedges, Structural Timber, Pegs, Dowels, Spelk Baskets, Tan Bark, Fencing, Rails, Struts, Clapboard, Panelling, Shingles, Ladders, Spokes, Gates. 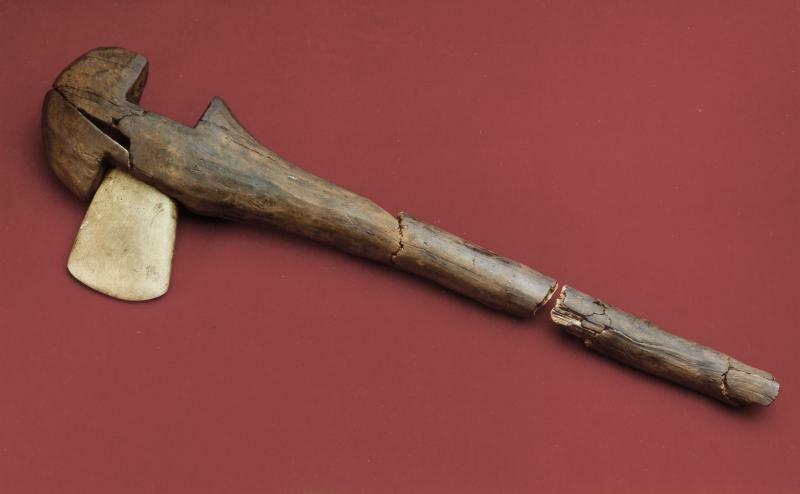 Although we tend to think of Neolithic wood working as being the exclusive product of polished stone axes, the available evidence hints at a broader range of tool types based on stone and organic materials such as bone and antler. My practical experiments over the years have highlighted issues with the notion of the polished axe as the “go to” tool type for all tasks. The biased preservation of materials such as wood, sinew and bone tend to paint a picture of a tool range based entirely of the use of stone. Recent discoveries have given us physical evidence for the use of bone chisels over stone. Our experiments in the manufacture of the Zurich doors for the Durrington Houses did however, showcase the refinement that could be achieved with a medium sized well honed flint axe in combination with bone chisels. Neolithic well linings from eastern Germany clearly demonstrate the carpentry abilities of 7000 years ago. It must be considered that the tools responsible for this work are available in unpolished forms all the way back into the Palaeolithic. The timbers are radially split and left with riven faces. 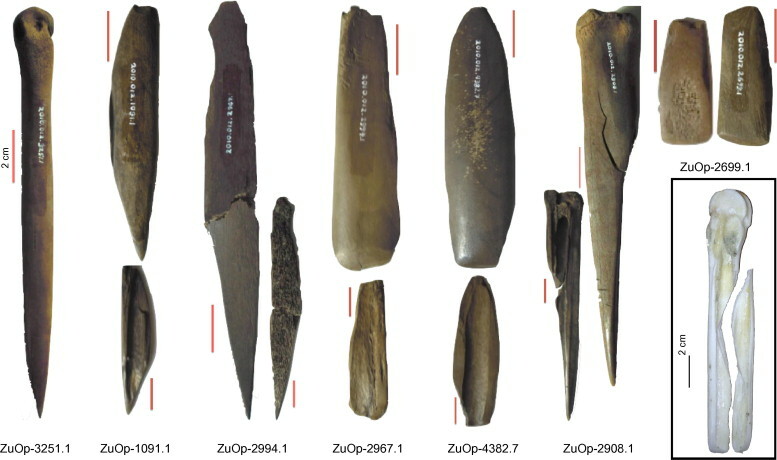 Where required, irregular faces are dressed with stone axes or adzes, and there is clear evidence for the scalloped gouge marks of bone chisels at the ends of some timbers and in the cutting of the numerous mortises that form the “tusk pegged mortise and tenon joints”. The relative lack of finishing must be seen in the context of a carpentry project that is intended for burial – as revetment for a well lining in soft ground. Given the complex nature of jointing techniques and some functional processing of the timber shapes, we can only guess at the refinement of carpentry projects intended for home life or surface applications such as furniture, structural framing, boxes etc. Apart from the physical marks left by bone chisels, recent discoveries from waterlogged sites in Switzerland have revealed bone and antler tool sets in remarkable condition. The tools are made from the hard outer portions of long bones (cortical bone) that have been shaped and ground to produce a cutting edge. Some of these tools show polish from significant use over time. My practical findings from the manufacture and use of bone tools shows that they are relatively speedy to make, quick to grind against an abrasive stone to obtain the required cutting bevel and work well against Green (unseasoned) timber. The working edge degrades rapidly and required regrinding at regular intervals to maintain a good working edge. The ability to make broad or narrow chisels enable the cutting of small or large mortises, and their relatively short lifespan make bone chisels an early disposable tool type that requires far less production input than a shaped and polished stone head. The easy availability of large animal bones would provide an abundant source of raw materials. It may be that smaller bone fragments could have been hafted as working edges in wooden handles. Regarding flint tools for timber processing and carpentry tasks, the evidence is abundant. We have every conceivable size of polished axe/adze for the felling and dressing of trees and split timber. We have smaller cutting heads that are capable of cutting certain joints and starting mortises. We have scrapers and borers that will produce small holes or fine surface finishes. The stone record completes our Neolithic tool set. And in conjunction with bone tools and the use of fire for the making of holes, gives us a good range of tools to employ in the production of any carpentry project. Obtaining timber that can form the raw material for a carpentry project from whole trees requires a sequential approach that is clearly visible in the Neolithic well lining remains. The process can be simplified into 4 stages. A basic set of tools will need to be produced to enable this phase. They will include wooden mallets/mauls and wooden wedges. For this project, the felling stage has been achieved by modern means. The principles of tree selection remain though. The specific carpentry project will determine the species and shape of tree that is initially sought in the woods. As far as possible, natural shapes in growing trees have been utilised in the production of specific shapes in carpentry. For example, the ribs of boat frames use the natural shape found where a limb (branch) meets the stem or trunk. Where curving timbers are required, it is far better to use a naturally curving timber than to shape a straight piece of timber – both in terms of strength (the curving grain is much stronger than cutting across straight grain to make a curve) and the labour required. This project requires straight timber to build an accurate cradle/sled for the monolith and so I have selected straight grained Ash for the task. Ash splits very well when “green” but is resilient in most applications. Regarding felling times using stone axes, I conducted an experiment in the material gathering stage of the Stonehenge Neolithic Houses Project where we felled a Pine tree with polished axes. The tree measured 400 mm in diameter and we used 10 volunteers who took 2 minute sessions (in rotation) in using polished axes against the tree to fell it. The axes were re-honed after each 2 minute burst to ensure an optimum working edge. The felling took a combined time of 2 hours and 50 minutes (not bad), but a staggering 11,477 blows! Once the tree has been felled and snedded (removing the unwanted limbs), the next task is to cross cut the timber into useable lengths. This is achieved using polished axes, with the timber being marked and cut (allowing for a wide cut with flint axes! ), and rolled when necessary to access the other side of the trunk. After felling, this is the most labour intensive stage of production and requires stamina, tool care, “green” wood, and accuracy. It is essential to open a wide cut to allow the flint axe to access the middle of the timber. A flint axe, struck perpendicular to the resilient grain of a tree can be broken! The splitting process turns whole trunks into lighter timbers by utilising the natural grain in the timber to direct a split. 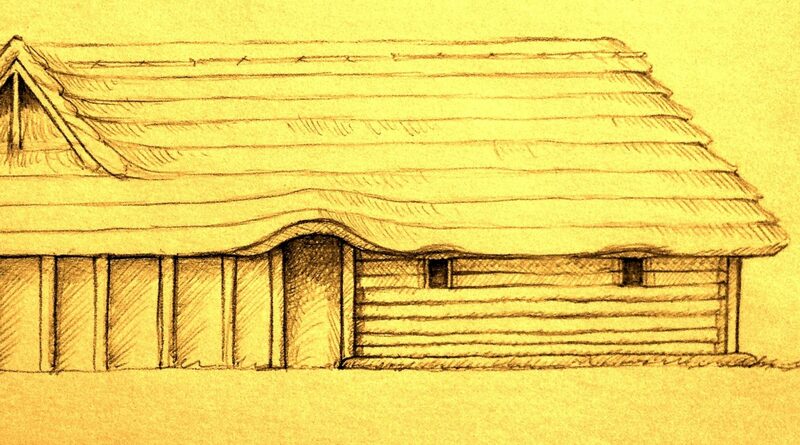 The principle is simple, practise can be very different (depending on the timber). Starting at the narrow end of the cross cut log, we use wedges to initiate a split. It is vital that this split is started at the centre of the WEIGHT of wood – think of slicing a cake in half to produce two accurate halves. 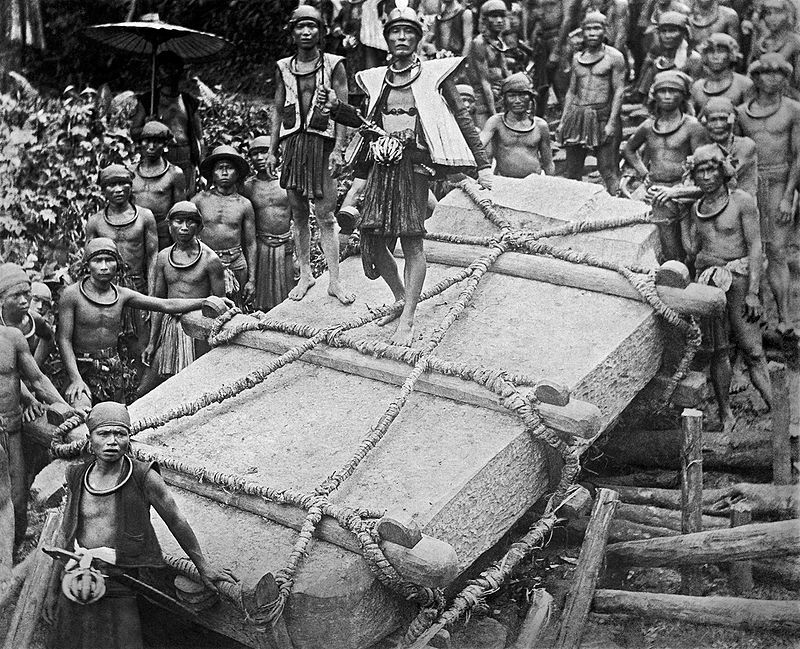 By forcing wedges into the end of the log, a split is initiated along the sides. It is worth taking off the bark along the sides to ensure you are seeing the split in the timber and not just in the bark (which may be different). Once the splits on both sides are visible, further wedges are inserted either into the split (if it is online), or ahead of the wavering split to adjust its course. Everytime a wedge is driven into position, the fibres of the timber split to accommodate it – listening and watching the very start of the split will help you to understand when a new wedge is required. Once two halves are produced, they are halved again to produce quarters and possibly eighths (depending on the timber dimensions required. The final stage of producing timbers for carpentry is dressing. This involves the use of flint axes and adzes to shape the split timbers to their finished (before jointing) dimensions. At this stage, the evidence clearly shows that where the split surface of the timber is flat, it is untouched by stone tools. Where there are irregularities or a different shape is required for a specific purpose, the surface is dressed. This stage can (where required) transform a wedge cross section into a square or rectangle. It is well known that making a structural timber from a quarter split trunk produces a far more stable piece of wood that will not be as prone to further splitting. Although historically modern, the picture below shows the degree to which processed timbers can be dressed to fulfill a function. The cradle holding this stone is beautifully made and even the ends of timbers dressed to prevent them from snagging and splitting further.